Scroll down to read a brief recommendation for each book! Long ago and far away I read fast. I tried to savor the book I was reading, but more often than not, I’d speed through the chapters the same way I eat M&M’s: swearing to let them melt slowly on my tongue until the colorful candy coating was gone, and then smushing the chocolate between tongue and roof of mouth to extract all the possible goodness from the candy. That usually lasted for the first M&M. Nancy Drew is to blame; she made mysteries magical to young minds. Until I started blogging, I read more fiction than non; I don’t know if that was cause and effect or merely coincidental. Blogging came into my life at the same time I was asking a lot of questions (primarily related to faith), and reading for the pure pleasure of it slowly dwindled. I seemed to think C.S. Lewis, Dietrich Bonhoeffer, John Piper, Richard Foster, Jim Cymbala, A.W. Tozer, Brian McLaren, St. Augustine, Brennan Manning, Shane Claiborne, countless others, might have answers*. Clearly, this was before the tsunami of contemporary books written by Christian women of the bloggerly ilk (many of which I’ve read, too; thankfully, not with the same amount of angst attached)**. It was during that time that my reading pace began to decelerate. I couldn’t read without a pen in hand, and if you didn’t know better you’d think I anticipated a quiz upon completion. I’d mark up my books with scribbled fury, and read and re-read That Thing I Needed To Remember, which I rarely actually did. I’d get lost in words, tangled in thought. Anyway, if you’re a reader, you’re likely to always have a stack of books on the ready. If you’re a reader like me, that stack never shrinks, the titles just keep changing. 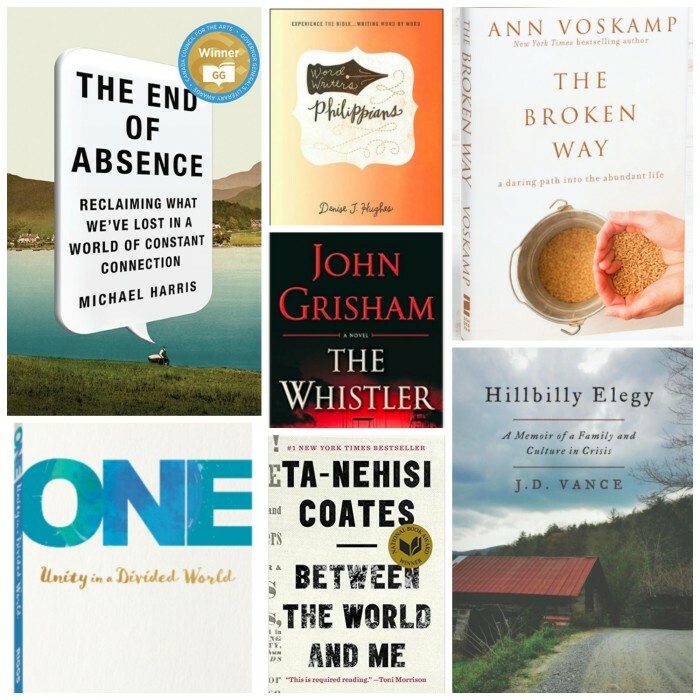 Here’s a few book recommendations I’d like to share (and why), and I DO hope you’ll chime in in comments with your own titles. 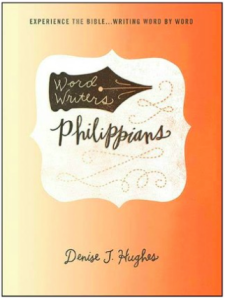 Word Writers: Philippians, Denise J. Hughes. Denise sent me an early copy of her Philippians study, and what she couldn’t have possibly known was that it is EXACTLY what I needed right now. It’s dynamite in a small package, the type study that gives you time TO THINK without telling you All of The Things, without trying to impress you; it doesn’t feel the least bit self-indulgent. It sticks to the Word, and what I most appreciate is how she’s woven four ways into its format to experience God’s Word–reading, writing, speaking, and praying over the Scriptures for that day. I can start and finish this study in one sitting, and there’s margin to consider application beyond its pages. If any of this sounds appealing, it releases September first, and I whole-heartedly recommend purchasing a copy for yourself. 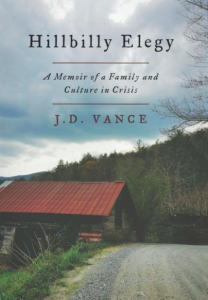 Hillbilly Elegy: A Memoir of a Family and Culture in Crisis, J.D. Vance. Which brings me to my next wanna-read. 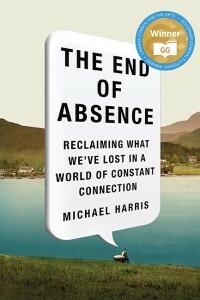 I think I heard about this book first on NPR’s All Things Considered last fall, and I knew I wanted to read it. It’s been almost a year – and a lot of troubling events in our country later – and I still haven’t gotten to it. But, I’ve heard enough to know this is an important book that will help me glimpse a perspective I can’t possibly fully understand. I just received an alert from my local library to come pick it up, and I have a sneaky suspicion I’ll want to buy it, too. Ann is a friend and co-writer from incourage, and I know she walks obediently albeit reluctantly in her role as “one of 50 women most shaping culture and the church today.” She earnestly deflects all praise and glory to God, preferring the refuge of family and home to the glare of center stage. 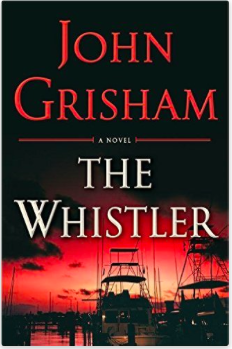 Used to be, every summer my beach read was whatever John Grisham had most recently published. The first book I read of his was the second one he wrote, The Firm. I can still remember hearing radio commercials for it every day while I was getting ready for work, “…from the author of A Time to Kill…” I don’t recall the rest of the ad copy – it was 25 years ago for heaven’s sake! – but it must’ve one whale of a call to action for me to buy it. Anyway, the beach home we rented a few weeks ago had an extensive paperback library and I picked up Grisham’s The Litigators for old time’s sake. For a few days, I read fast and without a pen in hand–it was marvelous! I remembered why I loved John Grisham in the first place: he’s an excellent writer who fleshes out engaging characters and, boyhowdy, he can tell good stories. So I’m eager to pick up his next one, due out in November. Another one that caught my eye after reading an intriguing article, this one REALLY gripped me (it inspired a blog post for The Art of Simple). It seems to speak to some of the feelings I have relative to the age in which we live, and if you were born before 1985, you’re going to want this one. 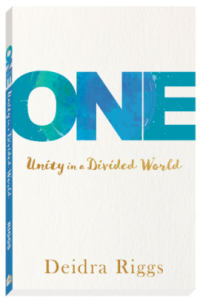 And one I cannot wait for that’s not due out until April of next year, Deidra Riggs’ One: Unity in a Divided World. Deidra is another incourage collaborator and friend, and it has been a treat to watch her mature as a writer. One is her follow-up to Every Little Thing, and I have a sneaky suspicion this book is going to be big. “Jesus didn’t say that the world would know we are his followers by our biting rhetoric, our political leanings, our charity work, or even by our knowledge of Scripture. He said the world would know us by our love for one another.” Yep…good stuff. It’s available for pre-order; order now and be happily surprised when it arrives in your mailbox next spring. 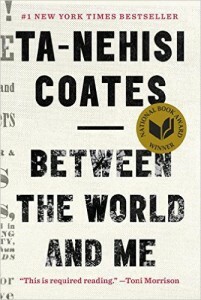 Your turn: What are your recent favorite books? Are there any due out in the next few months you can’t wait to get your hands on? Please share your recommendations in comments! *Writing out that list of authors WHOM I READ makes me feel a little cuckoopants right now…. Thanks for the recommendations Robin. I’ve been reading “too many” mysteries and little non latelyand hadn’t run across anything that piqued my interest. I recommend Henri Nouwen. Let me know if you DO read any, Linda, and please share your thoughts. And Nouwen? Oh my….let’s kick it off with something deeeeeep :). Ann Voskamp’s “One Thousand Gifts” is a huge favorite and her words continue to change my life. 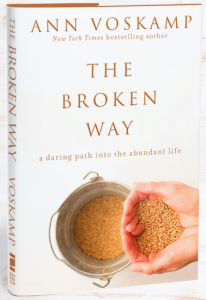 I look forward to her new book, “The Broken Way.” I am also reading “Ask It” by Andy Stanley which is about a question that really does help you in the decision making process. I think every high school student and every newly married couple should have this book and one of Dave Ramsey’s books on Finances… or one that he and/or his daughter Rachel wrote. I just finished reading “You Will Get Through This” by Max Lucado… couldn’t put it down. Everyone needs this book. Also read recently (again) … “The Art of Work” by Jeff Goins… another great book for college bound kids or recent graduates or just about anyone struggling with their calling/career or feeling stuck and are wondering “What Next ?? ?” If you like history I love the Civil War Trilogy by father and son Michael and Jeff Shaara (from which came the movies “Gettysburg” and “Gods and Generals”. It helps you see the very heart wrenching decisions made by all involved in both North and South who had often served together or gone to West Point together and then had to fight one another… also the fact that it was about so much more than slavery but was about some of the same things we are facing today… states rights versus federal governmental control… something that really makes you think no matter which side of the Mason-Dixon that you live on. Also, in the history category “The Nightingale” by Krisin Hannah… anything on WWII such as “The Fall of the Third Reich” …. not sure of author (but what happened to Ancient Rome as its moral degradation reached its nexus and what happened to society in Berlin in the 1930’s have parallels to what has happened in the US since the 1950’s). Frighteningly so. “Jesus Calling” is a devotional by Sarah Young that I was given a few years ago and find a great comfort and encouragement always. And Eric Metaxas’ new “If You Can Keep It” (a must as we approach what I consider to be the most crucial election in my lifetime and I am 58)…and any of his other books… or anything by C.S. Lewis, Henri Nouwen, or Os Guiness. 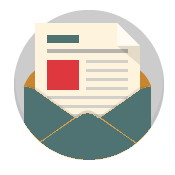 I just happily stumbled onto your blog – saw a link to the internet blog post on Tsh’s site from a link from Ed Cyzewski’s newsletter that came to be by email! And I love to get and give book recommendations! I seem to be reading a lot of WWII stuff lately – Lilac Girls by Martha Hall Kelly, The Nightingale by Kristin Hannah were two I just read this summer, and I just started “Everone Brave is Forgiven” by Chris Cleave. Also, The Kitchen House and its sequel Glory Over Everything by Kathleen Grissom are awesome. Another WWII I just finished is When We Meet Again by Kristin Harmel. On the Christian fiction side, books by Susan Meissner, Elizabeth Musser, and Cathy Gohlke are must-reads! One of my all-time favorite books is The Hiding Place!! 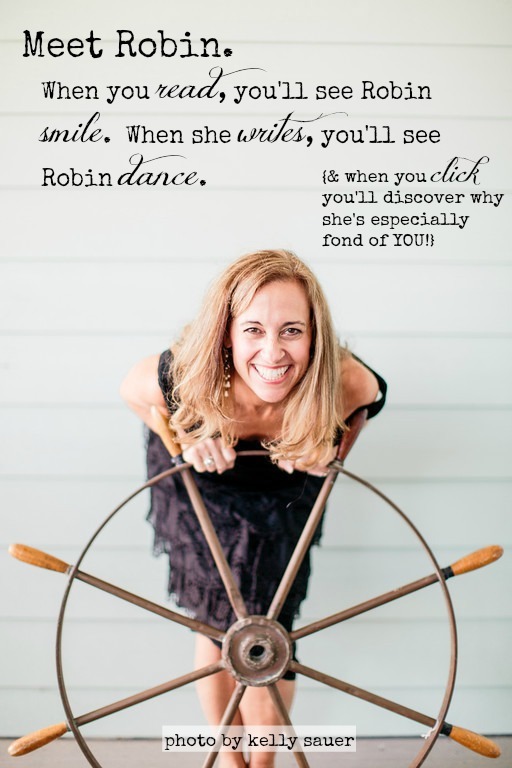 Thank you, Susan–for your recommendations and letting me know how you found my post :). That’s what makes this blogging thing so FUN! These sound interesting. Not reading much lately just taking care of aging dad. I will get back to reading something in the fall! thank you for the recommendations…I think I’ll be adding a few more to my pile! A book I read last year has become one of those books that I will read every year of my life. Pursue the Intentional Life by Jean Fleming…wow, how I would love to meet that woman. Maybe have a cup of coffee or take a walk with her…I feel like I get to know her a little bit better every time I read her book. What a beautiful soul. Pursue the Intentional LIfe….one of those books picked up while preparing to speak to our women’s group a couple years ago. You are so right, Tracy….I would so love to spend an afternoon (or week, or live next door) with her. Such wisdom. It’s a very good book indeed. It is fun to hear about the books others are reading, not that my stack needs anything added to it but I still do, nonetheless. One that I’m reading right now and have read several times before is Becoming a Woman of Influence by Carol Kent. Also, I’ve been waiting, waiting, waiting for the release of Falling Free by Shannon Martin. I preordered a copy last spring and it finally releases in 6 days!